Providers are increasingly responsible for populations of patients – quality, cost and outcomes. MetroCare is committed to providing the tools and resources to help member physicians succeed in the value-based environment. To assist with developing PCP-Specialist referral relationships, MetroCare is beginning to partner with some of our specialty practices and our PCPs to establish algorithms for addressing specific chronic disease processes. MidSouth Pulmonary has worked in conjunction with MPAC (MetroCare PCMH Advisory Committee) comprised of MetroCare PCPs, to develop an algorithm for evaluation, treatment and referral of patients with COPD. This algorithm encourages spirometry training and use in our practices for proper evaluation of the need for a pulmonary medicine referral vs. treatment within the primary care practice. Patients are often referred much too early, when they could be treated in the primary care setting. We offer this link to a training video for use in your practice, along with a related skills quiz, and a printable certificate of completion for your trained staff. Quiz and Certificate under development and pending approval. A recommended treatment algorithm is currently under development and pending approval from our MPAC committee. Our next target currently under development is our population of high risk diabetics with co-morbidities. This will be a multi-pronged approach involving development of a patient registry, staff education re: how to approach these patient most effectively, assistance for the practice with data analysis and trending results, and pharmacy information, along with existing opportunities such as risk coding training. 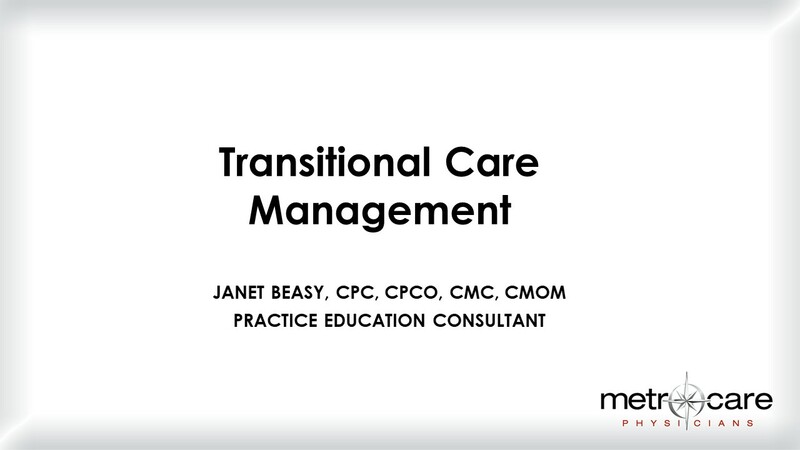 Transitional Care Management is the coordination and continuity of care for a patient being discharged from a specific facility type back into their community. 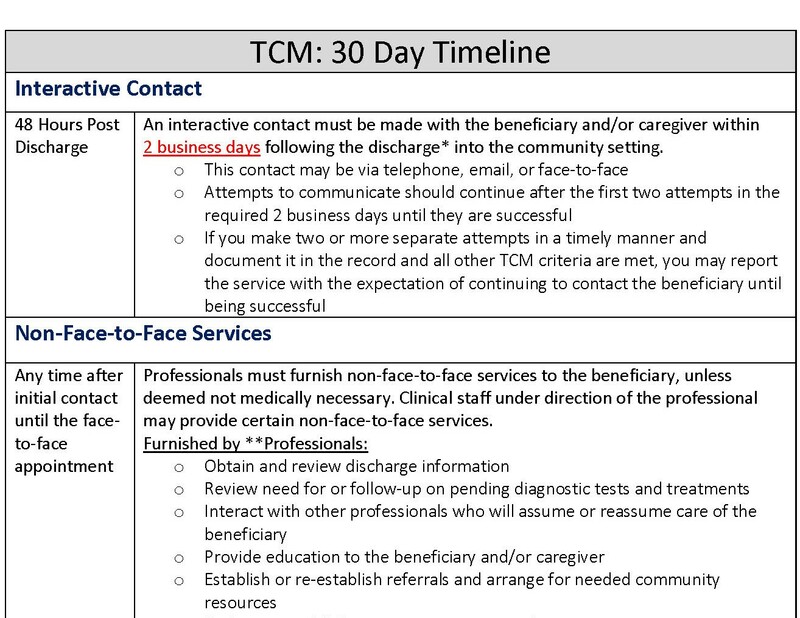 To prevent a gap in their care, the provider accepts responsibility for care of the patient with moderate or high complexity medical problems immediately upon discharge. One-Pager (click image above). TCM Slide Deck (click image above). TCM Workflow and Template (click image). Medicare wellness visits are yearly appointments to assess and update the condition of your Medicare patients for the purpose of creating and implementing a preventive health plan tailored to each specific patient with patient counseling and education to support that plan. These encounters are not routine visits for physical examination and treatment of conditions. They can, however, be performed in conjunction with a routine visit to avoid scheduling a separate appointment to address conditions requiring attention. Creation of a preventive health plan for the coming 5-10 years using risk assessment, screens, etc. MACRA is the Law. MIPS is the Process. The new, value-based payment format for Medicare was enacted as part of the Medicare Access and CHIP Reauthorization Act (MACRA) of 2015. The Medicare SGR (sustainable growth rate)was abolished. Measurement began in 2017 with Reporting in 2018 and (fee schedule) Adjustment in 2019. 2017and 2018 are Transition Years. You still have time to get your workflow in place to implement your measures for 2018. MIPS, the Medicare Incentive Payment System, combines three previously existing Medicare quality programs: PQRS, Meaningful Use, and Value Modifier. Though there are some exempt providers, the vast majority of providers will be subject to MIPS. 4. You are a non-patient-facing provider (i.e. pathologist, radiologist) with <100 patient-facing episodes in a designated period (or your group has >75% non pt facing providers). 3. 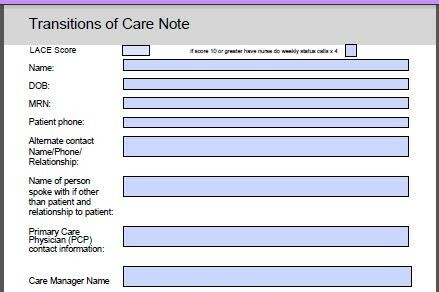 Practice Improvement Activities-value based activities often associated with Patient Centered Medical Home designation. https://qpp.cms.gov/mips/improvement-activities If you have achieved official PCMH recognition, you are exempt from this portion of MIPS. 4. Cost, gathered from your Medicare claims and formerly a part of the Value Modifier, is not reported separately by you and will count 10% in 2018. The cost portion of MIPS will be impacted by the level of risk coding submitted by your practice on your Medicare claims. We offer risk coding learning opportunities for physicians and staff. There is a bare minimum reporting option for 2018 for small practices (<15 providers) of only one patient for five measures (three minimum points per measure) if you just cannot begin to report more. This is not recommended, but it should prevent Medicare from taking a 4% negative adjustment to your base fee schedule. Meaningful Use is transitioning into Promoting Interoperability detailed here: https://qpp.cms.gov/mips/explore-measures/promoting-interoperability?py=2018#measures on the CMS QPP Portal. Full participation requires attestation to five specific required measures, though you may attest to more for extra credit. Full participation requires attestation to one high priority or two medium activities (for a small practice). The payment adjustments for 2018 performance to the Medicare base fee schedule as a result of the MIPS program begin in 2020. They range from a -5% for those who do not report any measures up to a possible +5% adjustment to reward those who fully report and attain quality goals. The adjustments will grow larger each year, so that the penalties grow yearly along with the possible rewards. 1. Continue to update your strategic plan for next year, as MIPS reporting requirements increase. 2. Use your EHR. Get one up and running or to become more proficient in using your EHR. You have time to make a plan to do this in a reasonable stepwise fashion. Claims reporting will phase out over time and PI will eventually be required. 3. Make sure your EHR is current. The PI (Promoting Interoperability) requirements specify that it must be at least a version 2014, should update to 2015. 5% bonus for 2015 ACI reporting. Contact your vendor to update your software, if necessary. vendor may assist with direct reporting from your EHR. 5. Take a look at the Improvement Activities. If you are already designated as a PCMH practice, you get full credit. If you consult your state database for controlled substance monitoring, you can report that activity. 6. Plan to report in early 2019. The deadline for 2018 reporting will be March 31, 2019. 7. Read your email! MetroCare will continue to send you information that will keep you informed and offer assistance with these processes. Our website will also continue to grow with more resources for your practice. 1. Promoting interoperability replaces the Meaningful Use EHR incentive program as a MIPS category counting 25% of the MIPS final score. 2. In the 2018, still a transition year of MIPS, attesting to the base measures in the PI category for 90 days will prevent the 4% negative fee schedule adjustment. A full year attestation with added measures will allow for higher scoring with possible upward fee schedule adjustment. • Use CEHRT to complete certain Improvement Activities focusing on care coordination, beneficiary engagement, and patient safety. • If you have a combination of technologies from 2014 and 2015 Editions that support these measures. • If you have a combination of technologies from 2014 and 2015 Editions. 1. Full reporting requires six baseline measures with one of those six being an outcome measure. 2. This year Quality represents 50% of the total scoring for MIPS. • Report extra outcome measures for 2 points each. • Report extra high priority measures for 1 point each. • Report your measures electronically via CEHRT certified EHR for one point per baseline measure-6 total points. 4. Quality points may total only 60 points regardless of the number of extra credit measures reported. • Must report 50% of all patients across all payers. • Must have at least 20 Medicare patients per measure reported. 6. You may report by TIN (practice) or by NPI (per provider). • If you report by TIN, the fee schedule adjustment will apply across the entire practice. • If you report by NPI, any adjustments will apply only to that provider. 7. Your Quality and Resource Use Report (QRUR) from Medicare for your previous PQRS reporting contains important information on your performance with past quality measures to help set expectations in choosing MIPS measures. Medicare will continue to provide this reporting on its portal throughout the MIPS program so that you may adjust your measure choices to achieve success. In October 2016, MetroCare instituted a targeted plan toward establishing population health efforts in our practices by bringing data and source materials to them for a Breast Cancer screening program to support our screening measures for the UHC contract. Now that our Cigna Trilogy contract is well under way, we are continuing our screening campaigns in conjunction with the Awareness Months for cervical cancer, colorectal cancer and STD screenings. Physician liaisons, practice navigators and/or transition coaches from MetroCare are visiting our practices with trend reports that further define opportunities to improve care along with controlling cost. MetroCare will continue to upload information and materials via Citrix Sharefile to help our practices with targeted campaigns for more preventive health screenings. We look forward to working with our practices to more firmly establish these steps to begin or further develop a practice plan toward value-based care. Our next target currently under development is our population of high risk diabetics with co-morbidities. This will be a multi-pronged approach involving development of a patient registry, staff education re: how to approach these patients most effectively, assistance for the practice with data analysis and trending results, and pharmacy information, along with existing opportunities such as risk coding training.